Nexus 7 owners, it's your turn. Earlier this evening, before many countries even had access to Nexus 4 or 10 orders, Google began pushing the 4.2 (JOP40C) update to the Takju Galaxy Nexus. After some patient waiting, it appears the Nexus 7 is now ready for an update as well. In case you don't feel like waiting on the OTA though, we've got the download link and some super-easy instructions for manually updating your favorite 7-inch slate. Sure, we're only a few hours away from the Nexus 4 and 10 launches, but that doesn't mean we can't have a software update or two while we're waiting. 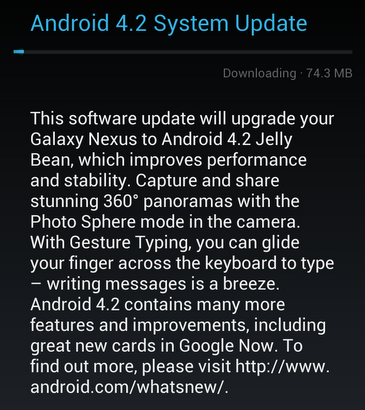 Some users on Google+ and Twitter are reporting that the Galaxy Nexus is receiving an update to Android 4.2 as we speak. Of course, if you're on a Sprint or Verizon device, you will probably be exempt right now, but if you see your miracle upgrade, speak up!